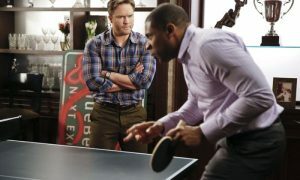 HART OF DIXIE Episode 3.19 Promo A Better Man : IN THE MIDDLE — Zoe (Rachel Bilson) finds herself in the middle of Wade (Wilson Bethel) and Vivian’s (guest star Lauren Bittner) relationship, putting her in an awkward position. Things between Lavon (Cress Williams) and AnnaBeth (Kaitlyn Black) are getting worse and starting to affect the town. Lemon (Jaime King) is upset when she receives a less-than-perfect health inspection grade and devises a plan to get it changed. Meanwhile, George (Scott Porter) needs a distraction and begrudgingly agrees to go on a date with a Bible School teacher. Tim Matheson also stars. David Paymer directed the episode written by Jamie Gorenberg (#319).